Wouldn’t it be wonderful if you could open your doors and windows and keep them open for as long as you wanted without concern? You can with the ultra-secure small house that I’ll soon describe. The popular method to secure a home is to install a security system, put bars on the windows, and add security screen doors. In most cases, unless they have a refined design, the look of bars and security screen doors are unattractive. Security systems seem like a good value, but they cannot secure an open door or window. You can have ultra-security by the way your small house is designed that eliminates the need for common security features. Have you figured it out yet? It’s achieved through a building technique that has been used for hundreds of years. Here are some more specific clues. You construct your house so that potential intruders cannot reach doors and windows. You put it in a position where you have the visual advantage. And you install hidden deterrents should they try. It’s not complicated and you’ve probably seen similar configurations, but perhaps not as a standalone house. Do you have it yet? Here it is. Drum roll, please. 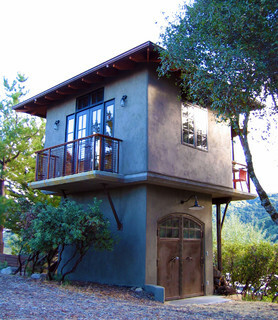 To have an ultra-secure small house you build it on top of an extra high multi-car garage! 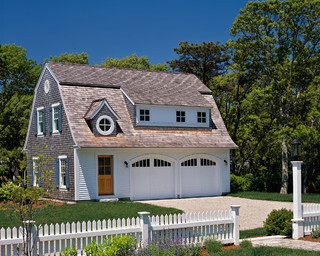 The goal is to build the garage with the highest ceiling that local building code will allow. That way the house on top cannot be accessed even with a standard ladder or from a fence. So as was done with hilltop, high walled castles, forts, and cities, superior height and visibly provides security against intruders. The only access to the house would be via a staircase inside the garage. You could add a double and even a triple layer of security by installing heavy exterior doors at the bottom of the staircase and at the entrance to the house at the top. The garage would have either no windows or a few windows with attractive security bars. The garage space could also include a workshop, storage room, and studio apartment for family, guests, or employee. 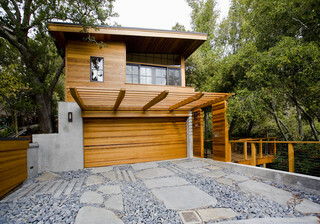 Depending on the square footage of the garage, you could have a patio or rooftop garden next to the house as well. Or you could have a patio between the main house and a detached small office or studio. During warm weather, you could keep all the windows and doors open 24/7! Given the house’s unobstructed design, you could expect outstanding cross ventilation. Your view would look over your property rather than out to it. Plants and other building structures would also likely not block your view.